Published on September 27, 2016 in General T&T, Integrity Commission, Parliament, PNM and Politics. 4 Comments Tags: Keith Rowley, Marlene Mc Donald, Politics, Selwyn R. Cudjoe, T&T Govt. I am an old timer. I believe integrity in public life predates the establishment of the Integrity Committee. My mother, born in 1909, used to say: “When ah dead, if anybody say ah owe dem any money, tell dem dey lie.” Her word was her bond. She believed each of us possesses an innate sense of what is right and wrong which tells us when we have transgressed those boundaries. Such a credo was part of an ethical value system that we, as black people, learned from our nineteenth-century ancestors. In those days, we did not need an Integrity Committee to tell us what constitutes ethical behavior. Published on March 18, 2016 in General T&T, Parliament, PNM and Politics. 7 Comments Tags: Abuse, Keith Rowley, Kirk Waithe, Marlene Mc Donald, Minister of Housing, Newsday, Politics, T&T Govt. 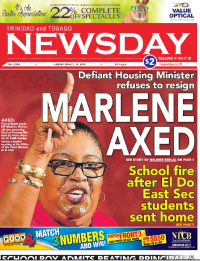 PORT-OF-SPAIN South Member of Parliament Marlene Mc- Donald was yesterday fired as Minister of Housing by Prime Minister Dr Keith Rowley during a tense meeting at 6.30 pm, at the Office of the Prime Minister in St Clair. Well-placed sources told Newsday that during the meeting, which lasted for about 30 minutes, loud voices could be heard. Sources added that McDonald later stormed out of the meeting, telling her driver that she had just been fired before making a call on her cellular phone as she entered her vehicle which sped off.